I start this thread, or actually just a post, to make everything that I tested the last few years and posted on BLF, a bit more accessable (yesterday I tried to put everything in my sig-line but that just looks ugly, so now the sig-line just contains a link to this post). If I do more tests in the future, I will add links to them in this post. As a general disclaimer, the minimum that I try to achieve in my tests is a good impression of what is going on with a led, spring, or whatever it is that I tested, which may be helpful in modding a flashlight. In some cases I dare claim that what I measure is a good approximation of the reality. In no test I claim that my results are the exact truth, as an amateur I make no use of certified or officially calibrated equipment, and the test set-ups are usually (though well thought-over) home-made contraptions. I do always try to pay attention to possible shortcomings of the used method. Driver hacks: cheap FET-converted Nanjg driver, re-building the intl-outdoor colour driver as a versatile PWM-less multimode multi-emitter driver. Very valuable info!!! Thank you for what you do, Jozz! Thanks djozz. You are a legend and your work invaluable. Your efforts are greatly appreciated. Nearly every light I build I use your info to spec it up. Very nice Djozz! The signature line was huge, glad you started this, thanks for all you do here! 1. Gaining knowledge, without retyping it all the time. 2. To show them that testing is a requirement for pushing the boundaries of our lights. Thanks djozz for being such a valuable, informative, and friendly part of BLF. So I take it the 219B V1 is coming soon? Yes…thank you sir. I was just about to look for a test thread on a red xp-e2…so you helped me out there, lol. Good catch, THE_dAY very kindly gifted me three Nichia 219B V1 4000K leds from Illumn.com, they are underway somewhere. When they are in I will test one (not to death, I will use them for a triple). I am mainly curious about the Vf compared to the old 219B and the 219C. Sweet. Yeah Vf, and maybe you could see if lumens are still increasing at 3amps? This is fantastic! I can’t tell you how many times I’ve referenced your data/tests to compare information for purchasing a particular light. Like most of the previous posts have said, your work is invaluable. Lets make this thread a sticky, it provides valuable info to us modders. Thank you for your hard work. Thanks djozz. You are a legend and your work invaluable. Your efforts are greatly appreciated. I already use the 219B V1 sw50 (5000k) @ max 2,4A* for momentary use, without issue, so far so good. It replace an old XML-T6. Temperature management seems to be more an issue than tint shift, get hot fast… Anyway, not using max for more than 1mn. The 219C’chart you released lately looks great for a 80CRI. Do you think it would be possible to replace a XP-L HI with a 219C (I don’t mind loosing lumens, but the XP-L HI is really too cool) or it would be better to simply use a XP-L warm high CRI? Thanks a lot Djozz.Your posts are “go to” posts. The 219B-V1 I have been using have a nice low Vf. Had a triple hooked up to a 105C 8*0,35+6*0,38 and guess what: Even with my very long and thin dmm probes I got 5.08A!!! I wouldn’t try these with a FET-driver, not even a triple, way too much amps, too much heat generated. A member of the german forum fried a triple with a FET-driver, got over 16A initially. Outstanding work djozz! Keep it going please, very appreciated. The 219B-V1 I have been using have a nice low Vf. Had a triple hooked up to a 105C 8*0,35+6*0,38 and guess what: Even with my very long and thin dmm probes I got 5.08A!!! I wouldn't try these with a FET-driver, not even a triple, way too much amps, too much heat generated. A member of the german forum fried a triple with a FET-driver, got over 16A initially. Outstanding work djozz! Keep it going please, very appreciated. That is a nice thing to look forward to. I was indeed planning using a FET-driver, but in a 18350 host, so that may just be perfect . Thank you very much Djozz. 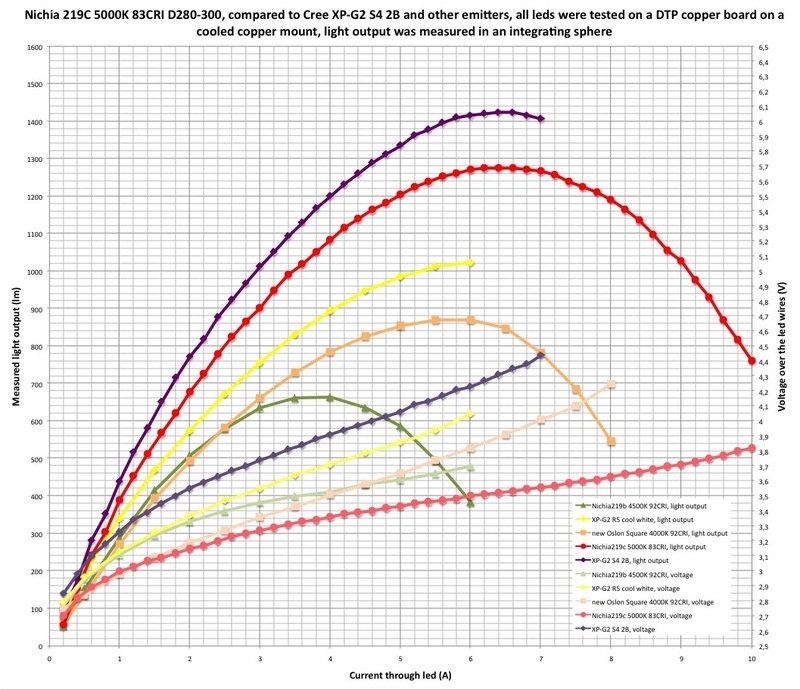 I made some X6 triples lately and wrote a build thread in german and I compared different emitters under all different kinds of CUTE-3-SS optics. I’m afraid you won’t see the images from the build and optics comparison without beeing logged-in, but: I think the beamshots should be visable to everyone. There are two X6 triples with B-V1 and some more lights, have a look if you’re interested. Thanks for your work Djozz. djozz, thanks for consolidating all your invaluable work! CityCoffee, I was planning on running the 219B V1 @~2.5A but you say that’s too much heat. Was it more heat than the XML it replaced? From djozz test of the previous 219B I thought it would be fine but I guess I might have to run it slightly lower. Thanks for all you hard work. This is an awesome resource. Your skills are very much appreciated! I believe that the 219B V1 can be used (for momentary period) around 2.5A without issue. Without good test (djozz’s style) I would hesitate to associate a 219b-V1 to a 3-3.5A driver. Again, what would be nice is a 219C CRI90 sw45 or sw50. Other 4-5000k NW led do not make the red and yellow pop-up as the Nichia does. Finally, compared with a cool-white it makes the v1 looks off-white again. Weird but finally, it is what should be a true neutral white> no hue perception and a good color resolution. I believe that some 3000k can provide a good CRI but with a strong orange hue.